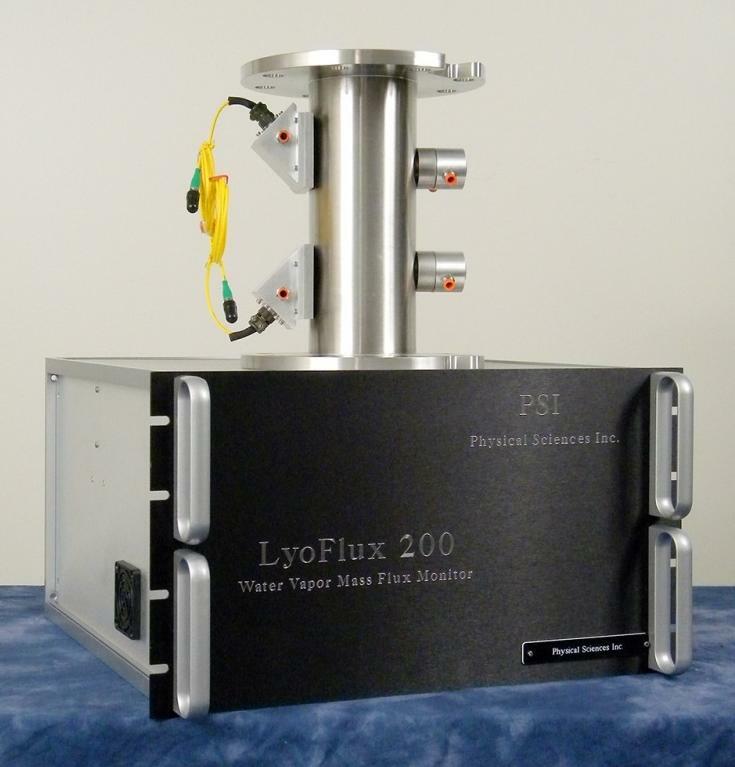 LyoFlux™: Tunable Diode Laser Absorption Spectroscopy | PSI - Physical Sciences Inc.
During the past decade PSI has developed a number of tools targeted at supporting the pharmaceutical industry, specifically the lyophilization or freeze-drying fill/finish manufacturing process. The first tool PSI developed was a TDLAS based sensor that measures water vapor concentration and gas flow velocity during freeze-drying. These measurements can be combined to calculate the instantaneous water vapor mass flow rate, the freeze-drying ice sublimation rate. The determination of the sublimation rate can be combined with a heat and mass transfer model of freeze-drying to determine a Key Process Parameter (KPP) during freeze dying, the product temperature at the ice sublimation interface. This product temperature is closely linked to product quality, thus the LyoFlux™ sensor enables real-time measurements that will enable process control and the manufacture of high quality product. The LyoFlux™ sensor, manufactured by Physical Sciences Inc. and distributed by SP Scientific, is the only commercial sensor that is capable of accurately and sensitively measuring water vapor mass flow during freeze-drying. It is one of the new tools that are transforming pharmaceutical lyophilization from an art into an efficient, science-based manufacturing process. PSI began LyoFlux™ development in 2004 as an internally funded research and development (IRAD) project. This IRAD provided feasibility data that attracted Phase I SBIR funding from the NSF. PSI in collaboration with our partners at the University of Connecticut (Dr. Michael Pikal) successfully completed the Phase I demonstration of monitoring sublimation in a laboratory scale freeze-dryer leading to interest from two manufacturers of commercial freeze drying equipment. Through continued support from PSI and one of the equipment suppliers PSI completed the LyoFlux™ product development and began to make sales to early adopters within the pharmaceutical industry. PSI and UConn concurrently attracted additional SBIR support from the NIH to demonstrate advanced application of the sensor, including a demonstration of the non-intrusive determination of pharmaceutical product temperature during lyophilization. PSI has sold over fifteen LyoFlux units direct to pharmaceutical companies and is currently partnered with SP Scientific to distribute the unique product. PSI anticipates future development to integrate LyoFlux™ into the freeze drying process control system.